The Mycelium Model of Glocal Governance is a governance structure that is parallel to the existing governance structures in the world. It does not aim to replace them. It is complementary to them. It has, however, the inherent power to transform them or to bring about new structures that make them obsolete. It is glocal, translocal in nature. It is decentralised, powered through the interdependent participation of local and translocal random groups of people. The Mycelium governance structure does not make decisions. Its function is to facilitate awareness of current consensus in society. Once collective realization arises, there should be no need for making "decisions". However, where decisions are made in the parallel old and emerging governance structures, this collective realization is taken into account as part of agreeing on the chosen path forward. From society, people gather in groups, meet at a venue or online, synchronously or asynchronously, with the aim to reach consensus. They make use of best practice methods and tools to help reach and formulate consent or consensus outcomes. The outcomes are shared with the public and amplified to society at large. Evolving best practices will continuously improve the way in which these outcomes are kept retrievable in the most relevant ways. The implementation of this model works by nursing and cultivating best practices for 1) People gathering, 2) Consensing process and 3) Sharing outcomes. As the quality and best practices in these three fields improve, the attention to these processes and the awareness of its outcomes in society at large will increase. As this governance culture evolves, it will be increasingly possible to respond to challenges by retrieving information on the existing collective consensus regarding how to handle the challenge. 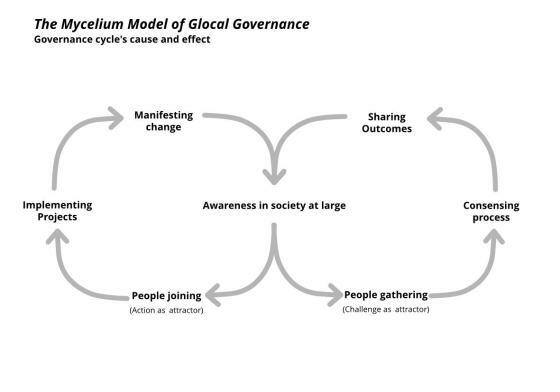 The Mycelium Model of Glocal Governance represents a fundamental shift away from decision making power structures to a culture of moving forward on agreed paths as a direct result of collective awareness. The model works with existing institutions, regulations, decision-making paths and control mechanisms and does not directly control how key individuals and other decision-making bodies are to be appointed. It influences these institutions, decision-making and control mechanisms as well as their appointment only in a way in which existing checks and balances are initially unchanged. Newly emerging governance structures evolve their mandate and their checks and balances independently as well, in accordance with current regulations and control mechanisms. The premise of the Mycelium model is a bottum up, organic and self-organisational approach that releases the full potential of individuals, communities and affinity groups to manifest change with greater sovereignty in a self-empowered, decentralized way. It at the same time ensures an increased likeyhood that the changes that are manifested are supported by a large consensus in society. The mycelium is both a local solution and an international solution that can work in tandem, or symbiotically, with existing systems as they are transforming. This is an enlightened, innovative way to approach the challenges we all face today, but it is also a model that is striking through its simplicity. It is spoken in the very language of the nature we are trying to preserve, not only as it relates to the metaphor of the mycelium shape, but also in the way it creates an entire ecosystem for current and future governance best practices and how it works with the nature of the human being instead of against it.